Nestled in the scenic North Fork Valley of Black Mountain, North Carolina is the Azalea House. At this sweet cottage, you can enjoy the babble of the creek while swinging on the front porch. You can also take in the stunning views of the Black Mountain Range and Blue Ridge Parkway while dining on the back deck. Your family will enjoy gathering around the fire pit to roast marshmallows under the stars. You will have a carefree stay with the fully-appointed kitchen, two private bedrooms, two baths, and a day bed for extra guests in the sunroom. Our home is a true vacation rental by owner. We clean the cottage ourselves to ensure a thorough and complete job. If any issues should arise, we deal with them quickly and personally. 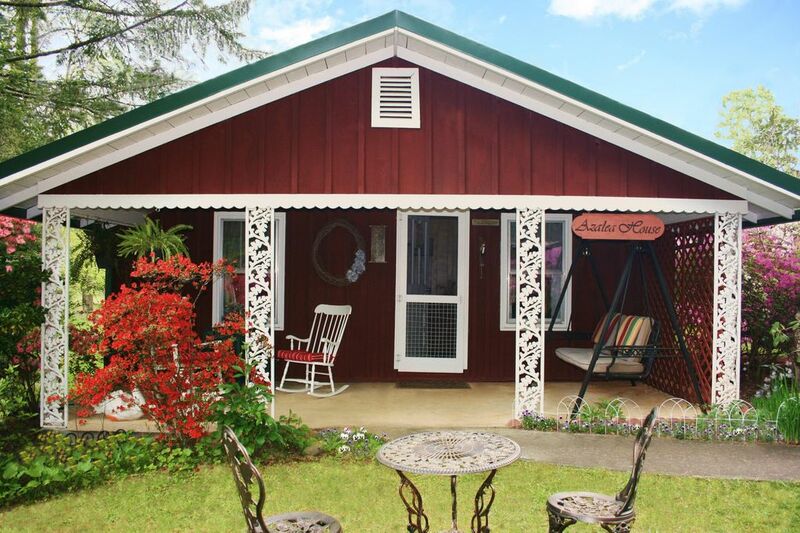 Delight in a peaceful vacation in the countryside while having the convenience of being only 2.7 miles from the heart of Black Mountain. A quick 20-minute drive will take you to Asheville and the Biltmore Estate. Come experience our beautiful mountain valley and become one of our many return guests. No, we do not have WI-FI. Talk to each other! Read a book! Unplug! If you plan on bringing your dog(s) please keep in mind that they must weigh LESS THAN 40 LBS. and NO MORE THAN 2 pets are allowed. There is a $75 pet fee PER PET. The VRBO site only allows you to indicate if you are bringing one dog and applies one $75 pet fee to your initial quote. If you plan to bring two dogs, the rate for your stay will need to be adjusted to include the additional $75. You should read all the pet restrictions listed under House Rules and Rates & Availability before choosing this home. Smoking in all its forms including electronic cigarettes is strictly prohibited both INSIDE & OUT of our home. Patchouli or other oil users are asked to discontinue use while staying in our home due to the owners and many others sensitivities to these scents. Use of diffusers should also be avoided. The Azalea House is Loraine's childhood home. Her family has been in the North Fork Valley since the early 1800s. She and her husband Johnny raised their four children in the valley and continue to live there today. Love grows best in little houses and this little home has held a lot of love over the decades. It is wonderful to see it not sitting empty and to know that others are now getting to enjoy its peaceful setting and charming atmosphere. Cozy, Peaceful, Comfortable, Quiet, Charming, and Homey are the most frequently used words to describe the Azalea House. Guests comment most often on enjoying listening to or even playing in the stream and gathering around the firepit at night to roast marshmallows. The scenery and tranquility of the valley are spectacular any time of the year. Our reviews consistently confirm that our home is exceptionally clean. We do all the cleaning ourselves to ensure a thorough and complete job. Any issues that should arrive during your stay will be personally taken care of right away as we live close by. The Azalea House is only 2.7 miles from the heart of Black Mountain. Enjoy the countryside while being only 7 minutes from Black Mountain and only 20 minutes from Asheville. Beautiful Walker Creek flows along side our property and is perfect for little ones to play in. Don’t forget your water shoes. The soothing sound of the water is incredibly relaxing. The cottage is nestled in the North Fork Valley and is surrounded by the Black Mountain Range. You can enjoy the view of the Blue Ridge Parkway while dining or just relaxing on our back deck. The owner prefers to wash the house linen herself. Never leave the dryer running when you' leave the house. A wonderful babbling creek borders the property that is perfect for little ones to splash in. Beautiful yard with a large flat area perfect for outdoor games. The stream, "creek" for mountain folk, that runs through the property is perfect for wading with the kids and lulling them to sleep at night. Our front porch swing and rockers are great spots for unplugging with a book or even a nap. Marshmallow roasting sticks and firewood are provided so that you can enjoy the fire pit with your family under the stars in our beautiful mountain valley. Wonderful little house by the creek! From the moment we walked in, we felt at home. This house is charming and so comfortable. We looked forward after each day of sightseeing to getting back to the house and get cozy by the fireplace. You can hear the soothing sounds of creek all night to lull you to sleep. This home is very clean. It reminded me of our cabin on a lake in Minnesota. Lorraine was so very friendly, and stopped by to see if we needed anything. We will definitely rent this house again! Quaint and Cozy! Love this place! I stayed here with my husband and twin toddlers during a short visit to Asheville. The place was very warm and welcoming. We had the pleasure of meeting with the owners when we checked in and really enjoyed hearing the history of the home. It made it feel even more special to stay here. It is literally like staying at Grandmas house. It has all the comforts of home with a calming creek in the front. Very clean space and short drive to the highway and Asheville. Cozy cabin and we definitely enjoyed our stay! Cute and comfortable and close to downtown Black Mountain and Montreat. Had everything we needed in the kitchen and was super super clean. We did need a few more blankets and it did have a slight older or musty smell to it. Overall great place and would stay again! We are so glad you enjoyed your stay and that you would like to come again. Now that cooler weather has finally arrived to stay we have added several more blankets to the cottage. If we had only known you needed more we would have been happy to bring them to you. The below average temperature for the weekend you were here caught us by surprise. The record breaking rainfall this year and unusually hot fall must have caused the slight musty smell. We will try to air out the house more often and hope for drier days. We would love to have you stay again anytime. The owners are so very nice and accommodating. I rented this for my father and brother to stay and they loved it! They stayed 2 years ago also which is why we rented it again. Convenient to Asheville and Blue Ridge Parkway. Views were great!! We will be back! The property is exceptionally clean and quite comfortable, we like the fact that it has 2 bedrooms and 2 baths and a completely furnished kitchen! We love the babbling brook outside the front door and enjoy sitting on the back deck with our morning coffee and taking in the view! We have been to Black Mountain many times and this is our favorite property to stay at. Beautiful and peaceful mountain retreat. Thanks to Loraine and John for making our "dogcation" so relaxing and wonderful. We really appreciate dog-friendly hosts and will definitely return! ENJOY FESTIVALS, FAIRS, and TRADE SHOWS: Crafts Fair of the Southern Highlands, Lake Eden Arts Festival , Herb Festival, Brewgrass Festival, Sourwood Festival, Folkmoot, Goombay Festival, Brevard Music Festival, Mountain Dance and Folk Festival. EXPERIENCE THE LOCAL ARTS: Biltmore's Summer Evening Concerts, Asheville Symphony, Diana Wortham Theatre, Asheville Ballet, Asheville Community Theatre, Flat Rock Playhouse, Montford Park Players, North Carolina Stage Company. VISIT HISTORIC ATTRACTIONS, MUSEUMS AND EDUCATION CENTERS: Southern Highland Craft Guild, YMI Cultural Center, Asheville Art Museum, Folk Art Center, Colburn Earth Science Museum , Antique Car Museum, Mountain Farm Museum, Pack Place Education, Arts & Science Center, Smith-McDowell House Museum, Swannanoa Valley Museum, Thomas Wolfe Memorial, Zebulon Vance Birthplace State Historic Site, Asheville Urban Trail, Asheville Historic Trolley Tours, Blue Ridge National Heritage Area, Carl Sandburg Home, Gray Line Trolley Tours of Asheville. SHOP for LOCAL ANTIQUES, ARTS, and CRAFTS: Asheville, Historic Biltmore Village, and Black Mountain. ATTEND NEARBY CONFERENCE CENTERS: Billy Graham Training Center at the Cove, Montreat, Christmount, and Ridgecrest. Pet Restrictions: $75 pet fee PER pet; Pets must be less than 40lbs. No more than 2 pets are allowed. Pets must be 100% housebroken. All feces must be bagged and placed in outside trash. Pets must be crated when left alone. Pets are not allowed on furniture including beds. Please bring something with you to cover our furniture and beds if you cannot keep your pets off of them. Our linen including blankets and throws should not be used for this purpose. Pets nails should be trimmed to protect our wood floors and furniture. Pets must not be aggressive to people or other animals. Violation of any of the above will result in the loss of the damage/security deposit. The second pet fee of $75 will not be included in the original quote. The quote will be updated once the renter indicates a second pet. A separate request for the fee will occur if payment has been made prior to the indication of a second pet. Smoking of any kind including electronic cigarettes is strictly prohibited both INSIDE & OUTSIDE of our home. Violation will result in the loss of the damage/security deposit. Patchouli or other oil users are asked to discontinue use while staying in our home due to the owners and many others sensitivities to these scents. Use of diffusers should also be avoided. Rates are subject to change until deposit is paid. Upon payment, the renter acknowledges and agrees to the house rules and pet fees.